If you are looking for a website that has a lot of payment options to choose from then you might want to check out 1xBet.com! Today, we will review their Sportsbook website and talk about the other available features that they have to offer. We will be talking about where they are located, how long have they been operating, what betting lines they offer and a lot more! The website was founded way back in 2016 and they hold a Bookmaker License from Curacao. 1xbet.com has the official name of Techinfusion Limited and is located in 235 Main Street Heritage House, 2nd floor, Gibraltar. Major currencies are accepted like USD, GBP, EUR, AUD, CAD and a lot more! They also provide different languages for our friends that are not fluent in English. The first thing that everyone would notice when they first visit 1xBet.com would be that everything is just messed up! And I do not mean that in a good way. Literally, everything is a clutter and it would take you a couple of minutes just a figure out which is which. They do offer online casino games as well as live games to bet on but there’s no line between them. It’s like the website designer ran out of money and just placed everything on one page. When they created the website, they didn’t bother on organizing but focused on providing betting lines instead. What they do not have in organizing, they have in volume. The number of lines is just crazy! For Football alone they have 940 matches from around the world! The matches range from FIFA World Cup Qualification Europe to World Championship U17. Here are the available sports that you are able to bet with 1xBet.com: Football, Ice Hockey, Basketball, Tennis, Volleyball, Table Tennis, Alpine Skiing, American Football, Bandy, Biathlon, Bicycle Racing, Bowls, Boxing, Cricket, Curling, eSports, Floorball, Formula 1, Futsal, Gaelic Football, Greyhound Racing, Handball, Horse Racing, Horse Racing AntePost, Hurling, Lottery, Martial Arts, Motorbikes, Netball, Rugby, Sailing, Skiing, Special bets, Speedway, Surfing, Triathlon, Trotting, Trotting AntePost, TV-Games. Aside from the general list of available sporting events, below are their featured sports along with eSport gaming. Football – Probably the largest sportsbook website that we have come across when it comes to betting lines. On the day this review was written, there are about 1940 Football lines that everyone can place a bet on! How crazy is that? A thousand nine-hundred-forty! Due to its culture, European countries are big when it comes to betting on Football. Some of the available events are UEFA Champions League, UEFA Europa League, Bundesliga, Serie A, Ligue 1, Promera Division, and a lot more! Ice Hockey – Ice Hockey is popular with the North American audience and some parts of like Finland, Germany, Sweden, Norway, and Russia. Here are some of the available Ice Hockey events you are able to bet on NHL, AHL, Karjala Cup, VHL, OHL, DEL, Mestis Liiga, Elitserien. Basketball – The NBA has become an inspiration to every basketball enthusiast. This sport is not just concentrated in a certain region, but is viewed around the world! To name a few basketball events we’ve got NBA, VTB United League, PBA, ACB, BBL, LNB, Japan B League, KBL, and Liga UPC. Tennis – A tennis match is always intense from serve to finish. This is why here at 1xBet.com you get to experience this with the best seats in the house! Here are some of the available Tennis events from around the world. ATP Shanghai, Davis Cup, Fed Cup, WTA Hong Kong, ITF Australia F7, ITF France F23, ITF Lagos Women and many more. Volleyball – Vollyball is not a stranger when it comes to sportsbook websites due to the fact that it is really easy to predict an outcome especially if you are watching a live game. Here are some of the available volleyball events you are able to place a bet on. Russian Cup, African Championship Women, Australia AVL, Brazil SuperLiga, Poland PlusLiga and a lot more! Click here to get the current Volleyball betting lines. eSports – In regards to their eSports betting, which is probably one of the most busiest sports betting niche today, they offer games such as CS:GO, DotA2, Overwatch, and the classic RTS Warcraft 3. We did notice that most of the available odds under their eSports tab are for CS: GO bets. Mobile Betting – Have you ever wished that you can just bring a mobile sportsbook so that you can bet on the go? Since this website was designed and created for the “real gamblers” that likes to have instant access to their bets, mobile betting isn’t a surprise. 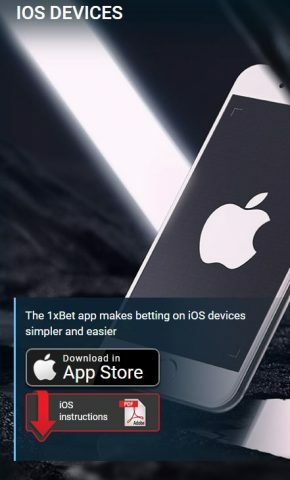 Here at 1xBet.com, you are able to download an iOS as well as Android Apps for this website respectively. Not only are you able to download mobile versions of the website, they also provide the appropriate instructions for each operating system. Live – Another great thing about this website is that they have live games happening all the time. Not just live listings but live streams of your favorite sports being played in front of you! What good does this bring you? Well, you are able to place bets in real time. If you are a huge eSports fan like we are, you would know that a crucial head-to-head match cannot be predicted properly unless the game is at its last minute. This is where “clutch” moves come out and this is where you ought to be in front of your computer/mobile device to change or add a bet to your advantage. There is also an option wherein you are able to watch multiple live streams in one page and bet on them simultaneously. Don’t get fooled by their “Live Casino” tab since this is not only what they have to offer when it comes to their online casino games. As mentioned earlier, the website was not segregated properly and everything is just everywhere. Their online casino games have been placed on different tabs which we are all able to access through their main page. Below are the available tabs that you are able to find casino games at. Slots – Their slot games are surprisingly located in one tab wherein you would see all the game providers that they have. Instead of choosing slot titles, you need to choose which game provider to go with and click on that provider. A separate window will be opened in line to what you have chosen. Here are a few game providers under their slots tab: Endorphina, Live Slots, Spinslots, Concept Gaming, PlaynGo, Quickspin, Xplosive Slots, NetEnt, GameArt, and a lot more! Live Casino – Of course, a good online casino website should and always have a live casino tab wherein we would be able to see beautiful dealers. Their live casino game providers are as follows: Grand Virginia, Extreme Live Gaming, Evolution Gaming, eZugi, Portmaso, Lucky Streak, AG, XPG, Pornhub Casino, GamePlay, NetEnt, and Vivo Gaming. Each of the mentioned game providers has their own set of available games. With his being said, please be advised that not all games are available in one provider, that’s why they have more than one. Our personal favorite would be Asia Gaming since they have the cutest dealers. In addition, available games found in their Live Casino tab would be: Money Wheel, Roulette, Blackjack, Poker, Baccarat, Sic Bo, and dice games. 1xGames – Is a tab wherein you get to choose all of the familiar games that an online casino would have. It’s like an easy access tab for people to get into their favorite games without any delays. This tab also includes really interesting games like Thimbles, Heads or Tails, Rock-Paper-Scissors, and even Dominoes! Bingo and 1xBonus – The Bingo tab contains all the available Bingo games that have for us to play with. Listed are a couple of Bingo renditions, and even Keno has been included. The 1xBonus tab contains all the bonus games that we are able to play with them. The tab also contains the eSports Bonus Calendar. We have been looking around their available casino games and their not as bad as it looks. What they have here is diversity, which is a great formula if you want to have a vibrant casino. The only problem is that it isn’t organized properly. Some might like it simple, others like it extravagant. But one thing’s for sure, bonuses are always great since we get the most out of our money. Here at 1xBet.com their bonuses reach up to 100 EUR! How great is that? They’ve got x2 Weekly Promotions, Serie A Match promotions, Lucky Friday, Beat 1xBet, and Lucky day wherein you are able to win up to 500 promotions points every day. You can read more about it here. In addition, the website also offers first deposit Bonuses of up to 100 EUR. Accumulator of the day – To get the accumulator of the day promotion, first you need to log into your account. Once you have logged in, head over to the Bonuses tab and click on the accumulator of the day promo. Once on the page, choose which game you want to use the accumulator and get 10% increase on the chosen odds. Please be advised that the content of the accumulators for that day cannot be altered. This means that what sports are available cannot be altered in any way. Advancebet – Here at 1xBet.com, registered users can place an advance 48hrs prior to the sporting event that you want to bet on. 100% Bet Insurance – With bet insurance, players can still get a part of the money they gambled even if they do not win the bet. Though this comes with a price, it is still better than receiving nothing back at all. Read more about this awesome bonus feature here.